I came across three pictures this morning that speak volumes about this government – about its deceptiveness and its real agendas. 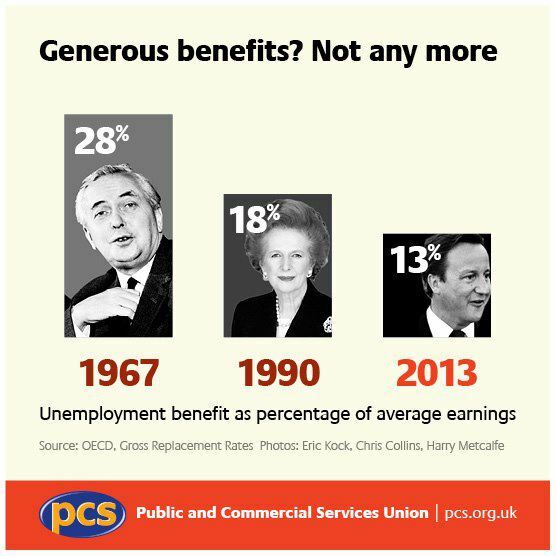 The first, from the PCS union via Sue Jones’ excellent blog, nails the government lies about the UK’s supposedly over-generous benefits system. The Tories in particular (although the LibDems tamely parrot the ‘company’ line) love to talk about ‘making work pay’ as though the way to do that is by turning unemployment into destitution. They talk as freely as they do inaccurately about ‘people on £100k of benefits’ and the ‘need’ to cap benefits at £500k per week ‘because it’s not fair that working people should get less than those on benefits, and use their ‘skiver vs striver’ rhetoric to deliberately mislead those who don’t know better into thinking that the ‘welfare’ cuts only affect some mythical class of layabout, when in fact the vast majority receiving benefits are working, but being very poorly paid. The net effect of all this is to create the belief, in the minds of those who get their news from the right-wing press or even, God help us, from the BBC, that the UK is too generous – that being unemployed is a ‘lifestyle choice’. Into believing that Shameless is real life. The answer is no – the Tories are lying (again). 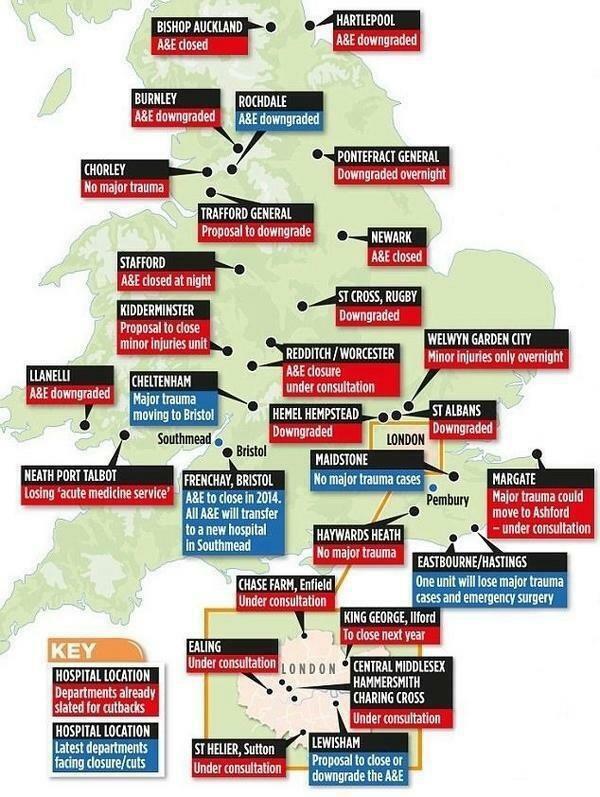 All across the UK, with almost no attention from the national press and television, hospitals are being quietly downgraded or close – and remember, this map is incomplete. Well, not quietly, exactly. Last month more than 50,000 people packed the streets of Stafford to march in support of their hospital, which is set to be broken up and probably sold off to private bidders – but were almost entirely ignored by the national media. But in this graphic, you can get a clear – if incomplete – picture of what is being done by the party that claimed ‘The NHS is safe in our hands’. Our 3rd picture takes us back to the supposed ‘skivers’ again – and again the source is surprising: the Daily Mail (via the outstanding Johnny Void blog). The government would have us believe that hundreds of thousands of disability benefit claimants are ‘swinging the lead’ and could work if they wanted. They even want us to believe that 900,000 ended their claims rather than attend an assessment of their fitness – even though the real figures show nothing of the sort. 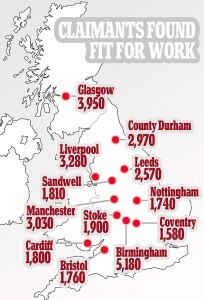 This map shows the numbers of people found ‘fit for work’ around the country. As Johnny Void points out, the figure in Leeds represents around 1 person in 300 claiming disability benefits when they could be working (even if the full figure shown is correct, which it won’t be – 40% or so of ‘fit for work’ decisions by Atos are overturned). Even if every figure shown was cast iron, among some 3 million disability benefit claimants, the totals shown here are tiny, almost negligible. Yet the government has promoted the ‘disabled skiver’ line so much that hate-crimes against disabled people have rocketed. They say that if a Tory’s lips are moving, he’s lying. They also say a picture is worth a thousand words. I’d say the latter proves the former. Wouldn’t you? A picture does tell a story, this story will become infamous…Cameron’s claim to fame!! Of the last picture… i think its telling that no one at the daily mail has any idea of where places are outside of London, they could have at least tried to get Manchester higher than Stoke on Trent’s real location, Birmingham higher than Northampton’s real location, stoke higher than Leicesters real location… tossers! Ha, true enough. I noticed, but was being generous since they’re actually providing some useful information for once! Yes I agree Stafford “A&E closed at night” is correct but hardly paints the whole story (which is that the CPT/Monitor report proposes closure of A&E, Critical care and all acute services (childrens, Maternity, Medicine & Elderly, Surgery …). If you do all that, do you have a hospital as the public would regard it? No – simply an ambulatory facility (very worthy and almost enough for some specialities but not a hospital and about as much use as a chocolate teacup if you are ill). I will – thanks for the pointer. The Daily Mail map of the workshy is an absolute disgrace – yet again, inspired by briefing from IDS. The Mail has consistently published these misleading statistics since the begining of this government. Their initial ploy was to combine the percentages of those placed in the Work Related Activity Group (WRAG) ie NOT fit for work at the present time but may recover in the future, with those found fit to work. One headline screamed 75% of all people on IB were fit to work – this figure only reached by adding in those placed in the WRAG. Nor does the Mail ever take account of succesful appeals, running at about 40%. It is interesting to note that the numbers in the Support Group have shot up to 30% since Dispatches revealed the 12% target. Prior figures showed only 6% made it into the Support Group.- which the Mail duly recorded with another headline that 94% of people were in fact perfectly capable of work. The government has not publicised that now there is no automatic right of appeal. All requests to appeal must now first go through a DWP “reconsideration process”. NO time limit has been put on this. Those who still want to then go onto appeal, must now prepare all the casework themselves and lodge the appeal directly with the Tribunal Service. In the meantime, ESA will be stopped. The only recourse for any income at all will be to sign on for JSA – where many people are refused as they are clearly not able to declare they are fit to work. Waiting times, just for Tribunals, are already running at a year in many places. With the new reconsideration process, this will now take as long as the DWP likes.